Program #ZINH023. Recorded in Taos, NM on April 17, 1999. 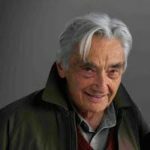 Zinn, the people’s historian, provides numerous examples of hidden material for possible movie scripts. There are great stories out there waiting to be told. Zinn recounts some of them. Recorded at the 1999 Taos Talking Film Festival. Introduction/tribute by David Barsamian.